I've been trying something new lately, and it's revolutionizing my life. I'm being honest with God. Maybe that sounds ridiculous. How could I be any more honest than I already was? I mean, He knows everything. He sees me as I am. You can't get more honest than that. But I've realized I'm still so much like Adam and Eve in the garden. I'm running frantically, trying to cover up my shame by haphazardly sewing together fig leaves. It happens most when I pray. I think I have to get it together first. I stop in the middle of my prayer, worried that what I said might be theologically inaccurate. I find myself about to complain about something and think, I can't say that to God. Look, I know it's silly. I've been a Christian for years and years, and yet I'm still running around in fear of being exposed. But now I've learned I'm free to be me and just let it all out. I'm praying as though my soul is naked and unashamed before the Lord. I can cry, I can confess, I can just pour it out—even if it's a complaint. He knows I'm thinking it, so why shouldn't I just let it all out? Many of the Psalms are great examples of this. What a loving Father we have to give us accounts of emotional people pouring out their hearts before Him. Some of the Psalms of lament are like what I hear myself saying sometimes—"This isn't fair," "This shouldn't be happening," "How long?" or "Why me?" But the Psalms give us permission to say it. God knows it's in our hearts, and voicing our doubts or anger robs these things of their power. The truth is, when I'm saying, "God, why are You letting this happen? Why are You doing this to me?" what I'm really saying is, "God, I don't trust You. Your plans are not good." It's in giving voice to my feelings—in really, truly being honest—that the Holy Spirit then illumines what's really at the heart of the matter. When we give voice to our complaints, our worries, our bitterness, or our fears, we aren't telling God anything He doesn't already know. What we are doing is laying ourselves bare before Him, holding nothing back, and asking Him to work. The Holy Spirit reveals the truth to us—because of Christ, we are continually with God. He is with us, and His Son is pleading our case before the Father. Like David said, "God is our refuge." The Holy Spirit also works by showing us the beauty of Christ. This is the kind of beauty that makes all earthly things look dull and dim. This revelation of Christ, seen in the Bible and illuminated by the Holy Spirit, causes us to say, "There is nothing on earth that I desire besides you." Worldly sorrow and sin will not last. Our flesh and hearts may fail, but God is the strength of our hearts and our portion forever (Ps. 73). So if you see someone standing at her kitchen sink or driving in her car talking to herself irrationally, that's probably just me praying. This week I've been telling Him, "I'm really upset with that person, even though I know it's wrong." And "I really, really don't want to do this right now. Help me, Jesus." And "God, I don't feel loving toward my family at this moment. Actually, I'm really super angry. Please, love them through me. I'm messing it up!" The beauty is that I don't have to cover myself with fig leaves anymore. God has covered me with Christ. He doesn't look at me and see my poor ability as a seamstress. He looks at me and sees His sinless, righteous Son. And He loves and accepts me because of Christ. I can truly be naked and unashamed. Do you ever find yourself sewing fig leaves in a feeble attempt to hide from God? 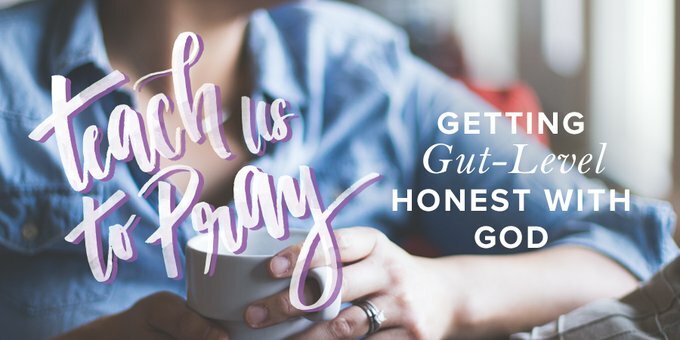 Have you experienced the freedom of just being honest with Him? During nap times and between loads of laundry at her home in Nashville, TN, Catherine Parks is a writer. At other times of the day you can find her either pretending to be a cheetah wrangler with her two small kiddos, or trying to convince her husband, Erik, to become a coffee drinker. Catherine has a BA in English literature from Bryan College and has finally put the degree to work in A Christ-Centered Wedding. Too Busy for a Prayer Life? When God Says "No" or "Wait"
Is Politeness Killing Your Prayer Life? Me . . . Pray With Others?